Their voices have not been heard since the First World War. With some help from a lipreader. I’m really surprised that nobody has done this before. Surely someone , somewhere must have thought of bringing in a lipreader. Their voices have not been heard since the First World War. The soldiers in these photographs are all long dead – some meeting their fate only minutes after the pictures were taken. But now, thanks to a lipreader, we know what the Tommies were saying. 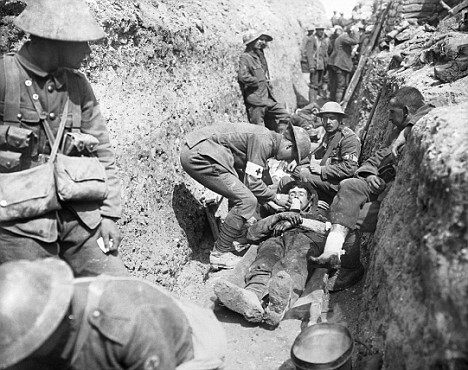 The stills are taken from a silent movie shot at the bloody Battle of the Somme in 1916, which on its opening day, July 1, alone claimed the lives of 20,000 British and Empire troops. One wounded soldier swears. Another voices deep foreboding about an imminent attack. Others, away from the Front, smile and shout greetings to their mothers. Their comments have been revealed for the first time in more than 90 years by lipreader Jessica Rees who, with three historians, has been analysing the film held in the Imperial War Museum – likely to have been one of many shown as newsreels in cinemas back home at the time. One clip shows a company of Lancashire Fusiliers about to go ‘over the top’ on that first day. They may have been among his last words. For, only minutes later, he and his comrades were cut down by machine-gun fire as they were ordered into battle. The latest research, which has resulted in a new book on the Battle of the Somme, dispels the long-held belief that such films were pure propaganda, featuring ‘staged’ battle scenes. ‘The bulk of the footage was not re-enacted for the cameras,’ says Alastair Fraser, co-author of Ghosts On The Somme: Filming The Battle. Ms Rees to ‘listen in’ to what the soldiers in the films were saying. Ms Rees, who is deaf, often appears as an expert witness in major court cases. She said: ‘What struck me the most was the optimism of the soldiers and their bravery. They were very upbeat in their speech. ‘It is impossible to tell whether this was due to their patriotism or because they had been told that an easy victory lay ahead but they were very jolly in ways that many of us, who now know the outcome and death toll of the Somme, find very hard to comprehend. Mr Robertshaw added: ‘Many of the men filmed were soon dead. Some were killed a little later that same day.